What does Ho Chi Minh City mean to you? Do not be muddled up with Hanoi, 1,000 miles to the north and the capital of the People's Republic of Vietnam, a Communist state. Ho Chi Minh City is of course the current name for Saigon. Saigon is a westernised version of a traditional Vietnamese rendition and is still the title of the river that runs through the city. And it is what the locals call it too! Vietnam is the easternmost country on the Indochina Peninsula in Southeast Asia. It is bordered by the People's Republic of China (PRC) to the north, Laos to the northwest, Cambodia to the southwest, and the South China Sea to the east. Independent of China, Vietnam was colonized by the French in the mid-19th century. They stayed for 100 years before being unceremoniously booted out leaving a nation divided politically into two countries. Fighting between the sides continued during the murderous Vietnam War, ending with a North Vietnamese victory in 1975 and defeat for the South and their US allies. In 1986, the Communist Government instituted economic and political reforms and began a path towards international reintegration. Its economic growth has been among the highest in the world in the past decade. These efforts have resulted in Vietnam joining the World Trade Organization in 2007. What is amazing is to visit Saigon today and find little or no resentment to the Americans, and many leftovers from the French occupation. The Vietnamese are a happy and hard working people very quickly catching up with the 21st century. Cruise ships call at Phu My about 50 miles from Saigon and if you are on a shuttle bus it is likely you will be dropped off at the Rex Hotel, made famous during the Vietnam War when its conference room hosted a daily press briefing derisively named The Five O'Clock Follies by cynical journalists who found the optimism of leading US military officers to be misguided. Its rooftop bar was a well known hangout spot for military officials and war correspondents and it is still a good place to view the city and have a drink. The bar area even has two swimming pools adjacent. Vietnam Airlines is a thoroughly modern carrier with a 70 aircraft fleet including Airbus A330 and Boeing 777s for international services. The domestic services are flown on Airbus 320 series with a high quality on-board service. The city airport dates from the 1930s, is within 15 minutes of the city centre, but is due to be replaced by a new facility currently under construction. Ho Chi Minh’s history goes back to the mid-1600s, when it was a fishing village under Cambodian Khmer control. Its strategic location on the Mekong River Delta quickly made it an important trading centre. 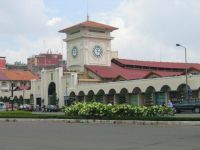 The French occupied the city in 1859, hoping to exploit commercial opportunities all the way to the Mekong’s headwaters. The heart of Ho Chi Minh City is a truly fascinating and bustling place to explore. 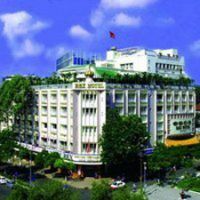 As Vietnam’s most cosmopolitan centre it has a racially mixed population and a myriad of national monuments, including many colonial structures such as the Notre Dame Cathedral completed in 1876, the French Colonial Post Office and the aforementioned Rex Hotel. The colonial part of town is home to the Museum of History, housing crafts and other local items displayed in chronological order. Another landmark, the Reunification Palace, is an historical structure that was formerly the Presidential Palace of the Republic of South Vietnam. The significance of this monument is as a symbol of the ending of the war. The grounds here are very beautiful, and the building today is still used for state occasions. Visits can be made but do check the opening times. The district of Cholon dates back to the 18th century. A bustling part of town with crowded streets, the name Cholon literally means 'Great Market', as evident by its bustling marketplaces. In the centre is the Palace of Seven Congregations, dedicated to the Empress of Heaven and the Military Palace of the Seven Congregations, where the General Chinese Association is held. There are numerous places of worship of almost every denomination. The city’s Chatham Church is where Vietnam’s President Diem was assassinated in 1963. 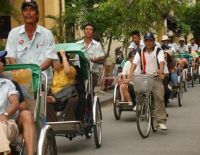 If you visit Ho Chi Minh City hire a trike rickshaw. You will have to negotiate the rate for one hour but it is great fun. Offer the hard working pedal pusher a little more to go faster. You can be certain you will somehow stop at a local ‘factory’ selling ceramics, artwork and footwear, much of dubious origin with well known labels. Vietnam is slightly smaller than Germany, but has a population of 86m as against 82m. Intel, the computer chip manufacturer has just built an enormous factory costing US$1bn. It is not a backward country, and is part of the tiger economies of South East Asia. A trip to Ho Chi Minh City is a real eye-opener. Don’t expect much help from the Vietnamese Tourist Board. Even the London Embassy could not get any sense out of them. They might even have marketing/PR representation in the UK but if so these people have not shown themselves to AERBT or its Editor. Perhaps this might change at WTM. It is certainly a country worth visiting.